Wondershare Disk Manager is a handy tool for both beginners and experts to copy hard disk and manage partitions. With its complete wizards, you will never make mistake when you need to copy disk/partition, create partitions, resize partitions, delete partitions and recover partitions. 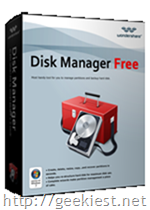 Now use Wondershare Disk Manager to reasonably allocate disk space and re-structure your hard disk for maximum use! » Disk management allows you to copy hard disk, delete all partitions, etc. Wondershare Time Freeze Free is an easy and effective virtual system freeware to keep your computer safe from viruses, spyware, Trojans and other malicious threats. It puts the actual system under protection and creates a virtual environment for system partition, on which you run applications and surf the internet. All traces and malicious threats will disappear after reboot. You can also save changes to the actual system.